Sarah Bailey and Matt Neff are two of many repeat volunteers at the annual watersnake census. It’s a hot summer day on Ohio’s South Bass Island. Near Scheeff East Point Nature Preserve, a small group of people are walking along the water, lifting rocks and looking intently at sunny spots. At a shout from one person, they converge and grab at a clump of writhing, black-and-gray scaled bodies, lifting the snakes up to stick them carefully into waiting pillowcases. 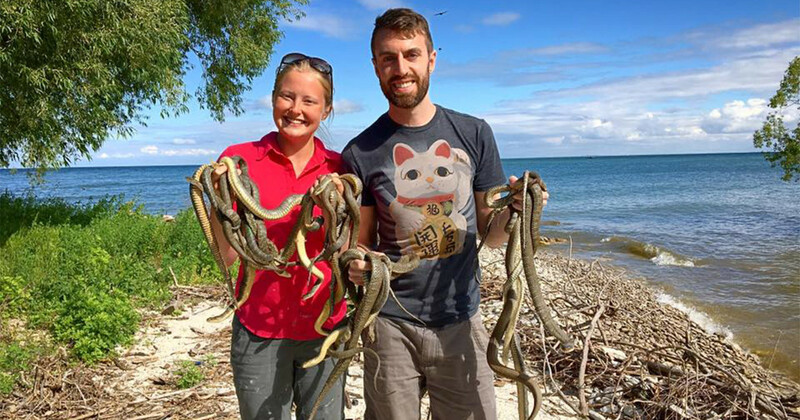 Northern Illinois University's Rich King and Stone Lab's Kristin Stanford played an instrumental part in the recovery of the native Lake Erie Watersnake. The lab, part of the College of Food, Agricultural, and Environmental Sciences (CFAES), is located at Put-in-Bay on Lake Erie. Nerodio is a play on the Latin name for Lake Erie Watersnakes, Nerodia sipedon insularum, and refers to an annual census of watersnakes on the Lake Erie islands. First started as part of the recovery program for the federally threatened snake in 2001, the researchers continue to collect data on the islands’ snake populations today, despite gradual reductions in funding following their removal from the threatened species list in 2011. That large data set includes nearly 35,000 captures of snakes over 38 years, with information on everything from population size and density to growth rates and survival in the tagged individuals that are found repeatedly over the years. Recently, the team has collaborated with researchers at the Wildlife Epidemiology Laboratory at the University of Illinois to monitor the spread and impact of snake fungal disease on the snake population, to help answer some long-term questions about how the disease functions in wild snake populations. 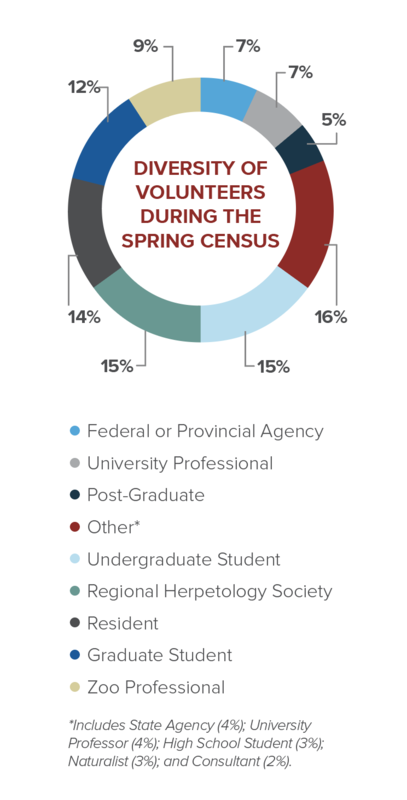 To collect that extensive data, Nerodio relies almost exclusively on volunteers, a model that isn’t common in ongoing studies. From 2002–2012, 179 people from all walks of life—island residents, graduate students, conservation professionals, and many more—participated in Nerodio, catching wild snakes, scanning them for microchips, and tagging the snakes that hadn’t been captured in previous years. It’s 570 hours of work that wouldn’t have been possible without their dedication. With volunteers covering multiple study sites across the Lake Erie islands during the two-week census, they’re bound to run into people asking them questions. They’re picking up wild snakes with their bare hands, after all. Stanford usually reminds them to send anyone with complicated questions to her, but most volunteers are comfortable sharing program basics with interested passersby. Sometimes, answering questions is what they do in their day job anyway. Matt Neff from the Smithsonian’s National Zoo & Conservation Biology Institute heard about the census from a former Stone Lab research assistant, Sarah Bailey. Volunteers also take what they have learned back to their jobs, or to other volunteer positions. Catawba Island resident Charlie Gunn has been a long-time regular at Nerodio. He’s also a volunteer with the National Park Service, so when Perry’s Monument on South Bass Island had to close down for repairs, Gunn worked with Stanford and the park’s manager to put on watersnake outreach programming for visitors. “Once he became familiar with the goals of our project, when the monument had to close down, he came over and talked to me about doing some watersnake outreach,” said Stanford. “He would check out one of our outreach animals every day that he was volunteering, and stand in the plaza and talk about Lake Erie Watersnakes. That’s the kind of dedication many programs hope to inspire in their volunteers, and Nerodio has successfully done so for almost 20 years now.